We are a full service conservation firm specializing in the assessment and treatment of paintings and murals, with extensive knowledge and twenty nine years of experience in the care and treatment of paintings, frescos, and murals, as well as decorative painted finishes. 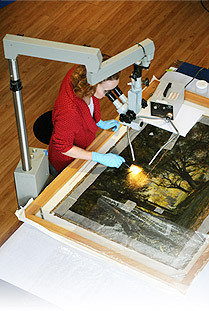 Since 1993, our firm has provided conservation and ongoing care of paintings to private collectors, government entities, foundations, universities, and small museums, such as: The Sam Francis Foundation, J. Paul Getty Museum, The Getty Conservation Institute, Norton Simon Museum, Huntington Art Galleries, City of Los Angeles, City of Santa Monica, Mission San Miguel, The Claremont Colleges, Wilshire Boulevard Temple, Mission San Juan Capistrano, Mission San Xavier del Bac, Natural History Museum, City of Hope, Japanese American National Museum. Through our conservation services we champion the latest developments in the field and integrate them with traditional and well-tested techniques and materials. By adding new techniques we create the effective convergence of scholarship and craftsmanship. Conservation is a complex field, and, at its best, a collaborative one. It requires the overlapping expertise of conservators in different specialties, conservation scientists and historians to fashion appropriate solutions to the diverse problems presented by the artwork. Our studio collaborates with museum as well as private conservators in the specialties of objects, paper, textile as well as earthen architecture to provide quality service to our clients. Other consultants offer engineering and preservation architectural expert advice, and services. The artist' original intent dictates our approach to conservation as minimal intervention and maximum re-treatability. Firm conservators are professional members of the American Institute for Conservation of Historic and Artistic Works (AIC), and uphold the AIC Code of Ethics and Standards of Practice, as well as the Secretary of the Interior`s Standards for Historic Preservation. The firm is certified with the City of Los Angeles. The firm contributed to Modern Paints, project initiated by Getty Conservation Institute. Research resulted in the 2011 publication of a technical report included as part of The Sam Francis Paintings Catalogue Raisonné.